Crafty Calendar Challenge : Crafty Calendar October Challenge - Halloween! Crafty Calendar October Challenge - Halloween! Hi and a big welcome to Crafty Calendar's October Challenge! Thank You to everyone who entered last months Bear Hunt Challenge! We really enjoyed seeing all the bears in action! Its time to choose a winner from last month! 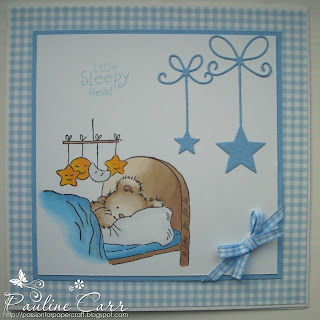 The winner will recieve a fab bundle from Crafty Ribbons!! Congrats, your notebook is gorgeous! If you send me a email with your home address i will get your prize organised for you! There is a winner badge in the sidebar for you to put on your blog! Thanks for joining in with our challenge and thanks to Crafty Ribbons for the sponorship! Annette - Must be your lucky day...Go put the lottery on! Congratulations girls, Your bear creations are stunning! It can be anything at all...cards, altered items, decorations, treat bags...you decide! We cant wait to see what you come u with. Our sponsor this month is a regular sponsor here... its the amazing Whimsy Stamps! The winner will win 5 digis of your choice...what a fab prize! Here is a dose of spooky inspiration from the Design Team!! This challenge will close on Friday 1st Nov at 8pm and the winner will be announced the following day when the new challenge is posted. Thank you for choosing my card to be in your top three. I'm so happy! Congratulations to the winner and other top picks. Cute design team samples. Love the little witches. Thanks for the "Halloween" challenge! Thanks so much for sharing such great DT inspiration pieces! And for the challenge too, of course. Please be sure to leave me a comment if this works for you. I'd love to know that I was able to help you!! Fabulous DT projects, thank you for the inspiration and another great challenge. Great projects by the design team! Fabulous DT creations, thank you for a fun challenge. Great challenge and wonderful inspiration by the DTs.